Jean-Antoine Watteau is credited with extending the bounds of the Rococo era beyond architecture, furniture and sculpture and into painting. In comparison to other art periods, Rococo was relatively short-lived. Perhaps it would've lasted longer had Watteau's life done so, as he was a key member of this movement, but he died of tuberculosis at the age of 36, at the peak of his career. Still, Watteau is known for developing a unique style and revolutionizing the art world through his individuality. 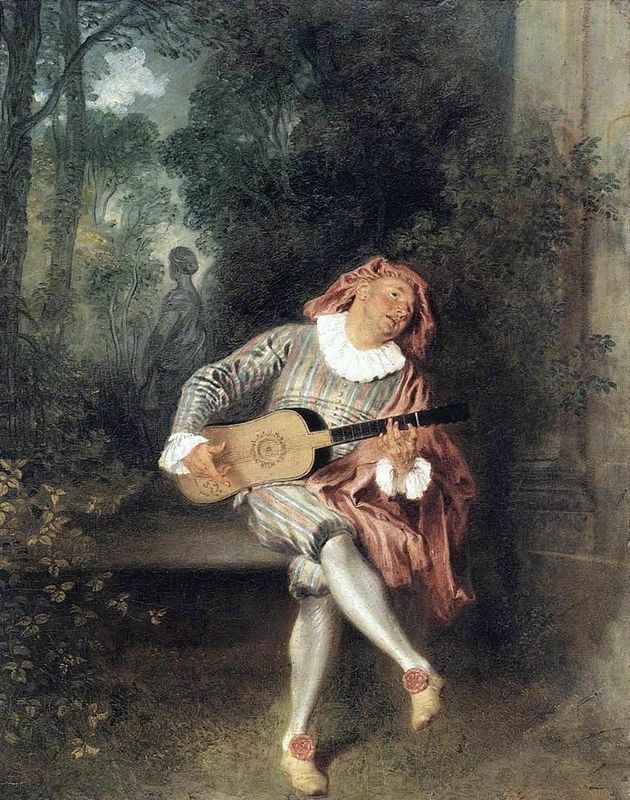 Watteau is most renowned for depicting everyday life through a theatrical lens. His love of Italian comedies and ballet is seen in his most notable and major works. In his idealized world Watteau depicts of the jovialities of human life combined with fantastic landscapes. Watteau's artistic career was a short one in comparison to other influential artists but he still managed to gain acclaim and influence a generation of Rococo artists. His impact on landscape painting and genre painting is still evident today. Little is known about the early years of Watteau's life. Details of his family and upbringing remain obscure though it has been said that his father was a roofer by profession. Watteau's life is chronicled after his moving to Paris in 1702 and, as for most artists, Paris was where the excitement began for the artist. Here his artistic ability grew and his influences merged to forge his individuality. In 1702, at the age of 18, Watteau traveled to Paris to jumpstart his career as an artist. There he was fortunate enough to study closely with diverse artists and was exposed to the work of the masters of previous centuries. Watteau later incorporated the culmination of these influences to form his signature style. Like all artists before and after him, Watteau started at the bottom, but his efforts were not in vain. His job as a second rate painter in a workshop, where he made reproductions of popular Dutch artists, developed his characteristic sketch-like technique. Just two years later in 1704, Watteau became the assistant of Claude Gillot, an artist who would heavily influence and change his work forever; the content of Gillot's work (theater) evidenced a sharp contrast to the pompous official art of Louis XIV. 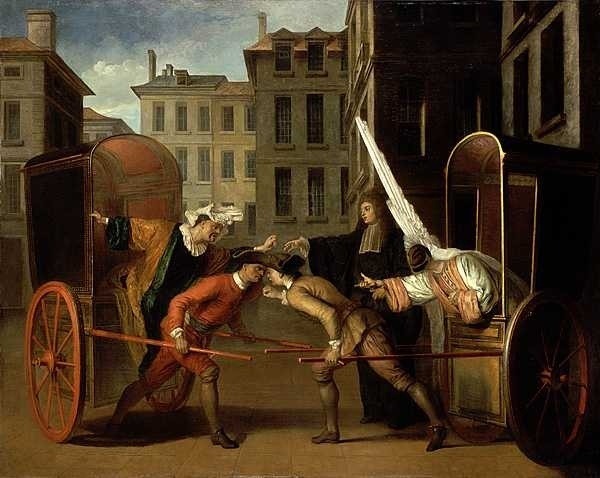 Gillot was a set designer and acquainted young Watteau with the Commedia dell'Arte (whose actors were expelled from France seven years earlier). Watteau wholeheartedly embraced the characters of the Italian theater and Gillot's influence lasted throughout Watteau's career. 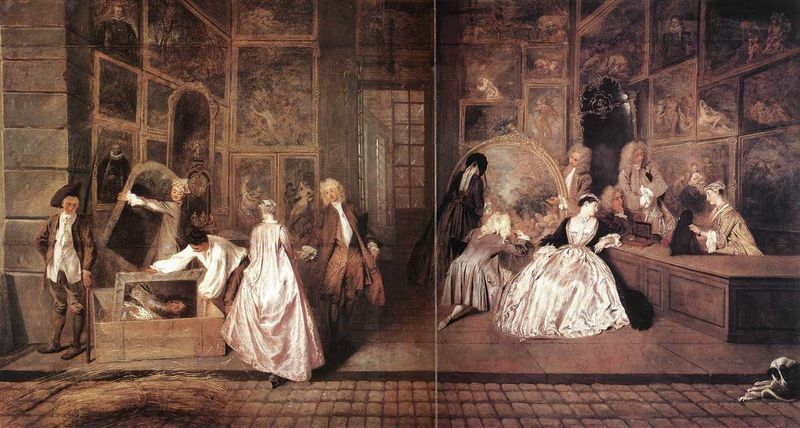 Watteau's next major influence came in the form of Rococo interior designer Claude Audran III. At Audran's workshop, Watteau was exposed to more natural and organic reflections, such as the S curve, or shell-like shape. 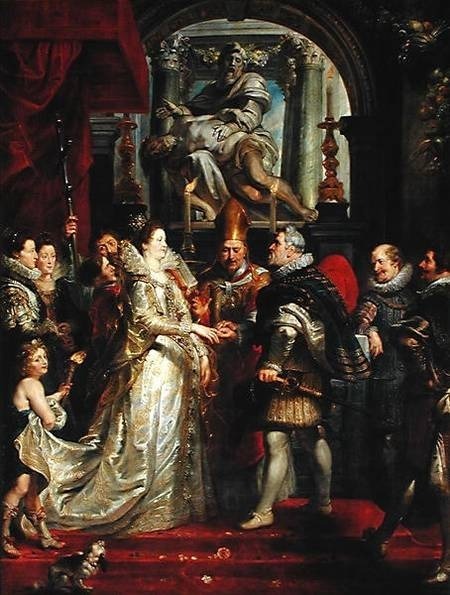 Audran was also responsible for introducing the young Watteau to the work of Peter Paul Rubens. 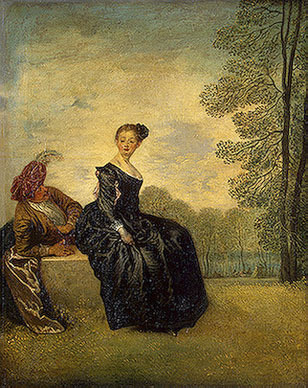 Audran was keeper at the Luxembourg Palace- a privilege Watteau took full advantage of as he was able to study firsthand Rubens' Marie de Medici Series. Rubens proved inspirational in Watteau's formative years. Watteau began to draw with ornate elegance and in the truest style of Rococo and he was the first to bring such a style to the canvas. It had been previously seen only in architecture, interior design and pottery. Drawing on the influence of both Gillot and Audran, Watteau developed his own unique style through executing theatrical themes using an airy technique. He wanted to produce more original work and test out the new ideas brewing inside him. In 1709, Watteau competed for the Prix de Rome (a scholarship for art students) at the Royal Academy of Painting and Sculpture and earned second place. When he entered the competition again years later no prize was offered but he did win the recognition of Charles de la Fosse and the Academy President, Corneille Van Cleve. Watteau was invited to submit to the Academie de Peinture in 1712 thanks to the talent he displayed throughout the series of elimination rounds. It took him five years to complete his reception piece, Embarkation for Cythera, but in 1717 he became a full member of the Academy. 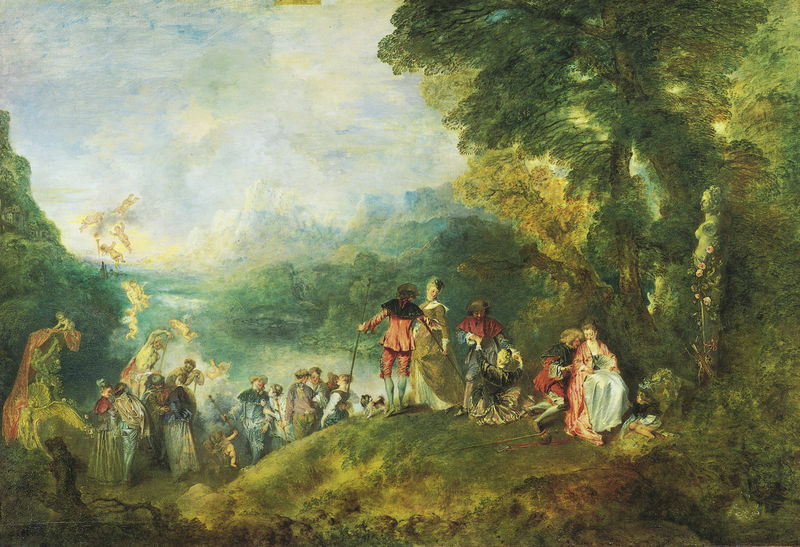 In Embarkation for Cythera, Watteau painted Cythera, the Greek isle of love, with characters of the Italian comedy, enjoying the beautiful scenery they were graciously painted in. Watteau's combination of theater and design was fresh and as his work did not fit in any previously created categories, the Academy judges accepted Watteau under a category of his own, "fete gallantes" or 'grand themes'. The judges were impressed with the sweetness of the artist's palette, which paid homage to the colorism of sixteenth-century Venetian, and his aesthetic of Rococo décor. 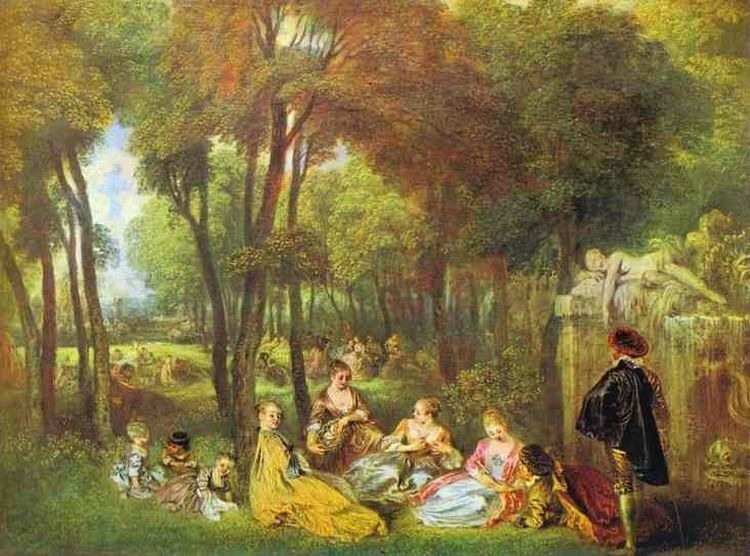 Watteau used various S and C curve lines in his fine detail and his brush techniques created a mood and ambience rather than reflecting reality. The Embarkation for Cythera was set in a hazy dream-like atmosphere and today resides in the Louvre in France. As with the Embarkation for Cythera, images revolving around the theater dominate Pierrot, which displays a sad clown as the main character. Such inspiration again leads back to Claude Gillot and other characters from the Commedia dell'Arte make appearances in the painting. In Watteau's 1718 masterpiece, La Boudeuse (The Capricious Girl), images of love and seduction are laced with the dangers that unbridled passion bring about. In 1715 Watteau returned to Paris where he met Pierre Crozat, a rich financier, art collector and admirer of his paintings and Watteau lived in Crozat's home for some time. At the age of 35 the artist's tuberculosis began to flare up and so he traveled to London to seek the aid of a reputable physician, Richard Mead. 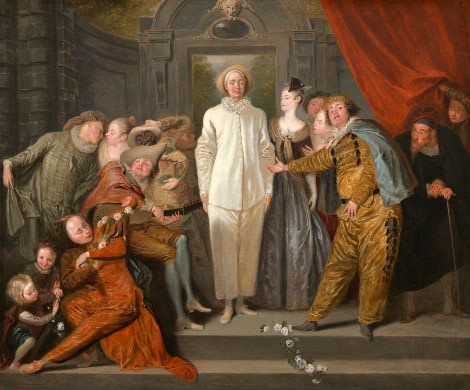 The doctor was the lucky recipient of Watteau's The Italian Comedians. The following year he returned to Paris yet again, this time residing in the home of E. F. Gersaint, an art dealer. In similar fashion, he painted for Gersaint and created one of his most famous works, L'Enseigne de Gersaint, (the interior of Gersaint's shop). It is a prime example of Watteau's draftsmanship and his skill as a colorist, and he completed the piece in just eight days. Soon after completing this work Watteau's condition further deteriorated and he insisted on retiring to the country in fear of becoming a burden to Gersaint. 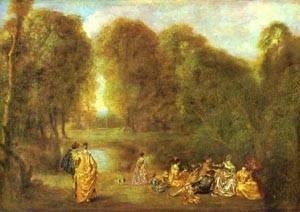 On July 18, 1721 Jean-Antoine Watteau, perhaps the finest Rococo artist, died in his home at Nogent, a city near his birthplace of Vincennes. He was only 36 years old and at the prime of his career.